Summer camp is not just for kids. 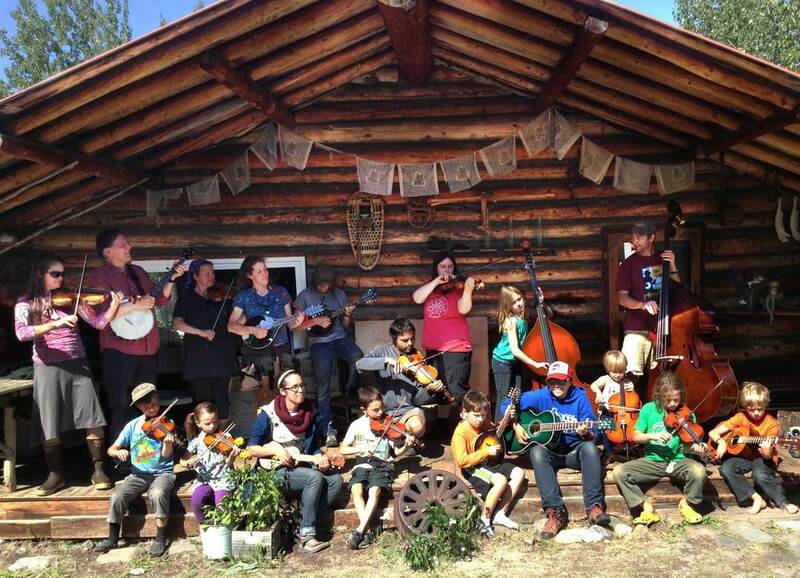 At the McCarthy Family Music Camp, all family members get to enjoy learning and playing music with others, accompanied by the melodies of some of Alaska’s biggest glaciers and most inspiring mountain scenery. During our tune-filled, action-packed folk music camp, families will engage in multiple instructor-led group sessions and classes. Family members will have opportunities to play together, as well as with individualized peer sessions. Craft activities for youth and exploration of the Wrangells environs will round out the fun. Brian DeMarcus has a music and dance career dating back four decades. Starting in 1971, he spent 12 years touring professionally with the Green Grass Cloggers, a music and dance group from North Carolina, taking the rich traditional sounds of old-time string band music and Southern Appalachian clogging out of the mountain regions and into venues around the world, from Europe to South America to Carnegie Hall in New York City. Brian has been calling dances worldwide and he has taught at most of the prestigious music and dance camps around the country. Over the years, he has played with a multitude of bands and has won many awards at fiddlers' conventions around the country. He is currently active with several bands in Alaska, his favorite genres being Old-Time, Cajun and Zydeco. He calls, and plays and teaches clawhammer banjo, bass, guitar, and ukulele and dance calling at music camps in Alaska and in the Lower 48. He has published a book of his original dances called Hands Four And Square Your Sets that was featured in “The Country Dance & Song Society Newsletter” and in “The Old-Time Herald”, an international traditional music magazine. Ian Wahl is an Anchorage-born musician who has performed and recorded with several Alaska bands, including Naked Mabel and Hot Sauce. He performs and teaches a multitude of instruments at all levels. Singer-Songwriter, Chris Snyder, plays an eclectic acoustic blend of music styles that define Americana. With musical influences ranging from John Prine, Leonard Cohen and Guy Clark, to Jack Johnson, Sublime and Bob Marley, his never-ending supply of well-known songs is sure to get your attention! A multi-instrumenatalist, you will see Chris playing Piano, Drums, Ukulele and Guitar. But his most moving instrument is his voice. A wide range of rich lows to a falsetto of perfect tone. Chris actively tours the Lower 48, based out of Stillwater, MN with long songwriting stints back to his homeland of Alaska. His original music speaks to the soul and his covers are truly his own brilliant style. The McCarthy Family Music Camp is open to musicians of all levels; parents can be beginners too! This year we will be accepting students in violin/fiddle, banjo, guitar, ukulele, bass, and mandolin. It is our experience that children are most likely to benefit from the structure of a music camp if they are at least eight years old. However, our goal is to accommodate families. We know there are prodigies out there, or just really cute ukulele players, so drop us a line if you have questions. The Family Music Camp is offered by the Wrangell Mountains Center, which is based in the rustic town of McCarthy. Our campus, near the foot of a 25 mile long glacier, includes the “The Old Hardware Store”, which is listed on the Register of National Historic Places, and our newly acquired Porphyry Place. The solar-powered campus includes several meeting areas, a communal kitchen, classrooms, storage spaces, a greenhouse, and gardens, which provide fresh greens during meals to camp participants. Participants are invited to camp on the banks of the Kennicott River, a short walk away from campus. Participants may also elect to stay at one of the many other local accommodations. Tuition at the Family Music Camp covers dinner every night of the camp. You are on your own for breakfast and lunch, but are welcome to store and prepare food at the Old Hardware Store. There are two other eateries in town, as well as a place to get a cup of coffee any time. With advanced notice, family members who are not registered in the music camp are invited to join us during dinner for an extra $15/person per day. Participants should plan to arrive in McCarthy by 3:30 pm in time to get settled and enjoy orientation before dinner on Thursday, July 13th. The workshop ends with noon-time public performance on Sunday, July 16. After you register, you will receive a welcome packet with more information. The town of McCarthy is set in the heart of Wrangell-St. Elias National Park and Preserve, the largest national park in the country. Wrangell-St. Elias is world renowned for its wild landscapes, high peaks, massive glaciers and rivers, healthy ecosystems, and dramatic scenery, as well as its unique cultural history. McCarthy is approximately a seven hour drive from Anchorage or Fairbanks (plus time for sightseeing, et cetera). It is possible to fly or arrange shuttles from Anchorage to McCarthy, and occasionally we can help arrange carpools for participants, though we make no promises. McCarthy and neighboring Kennecott, a national historic landmark, are situated within the Kennicott Valley (note the different spellings between the natural features and historical features.) McCarthy and Kennecott serve locals and travelers alike as a gateway to world-class backcountry opportunities and amazing front country hikes and walks (including access to the Root Glacier); the Kennicott Valley also provides a window into some of the most unique chapters in Alaska's history and an authentic, lively contemporary community. For information about the nature of the camp and instruction, please contact Lilly Goodman-Allwright at lgoodman@mtaonline.net. For more information about facilities, registration or the Wrangell Mountains Center, please contact Stef Tschappat at stefanie@wrangells.org. Support the WMC Family Folk Music Camp! If you would like to contribute to the cause, your very much appreciated tax-deductible donations can be sent to the Wrangell Mountains Center at PO Box 142972, Anchorage, Alaska, 99514. With sponsorships of more than $250, a full 8 ½ x 11 “thank you” poster will also be posted for the duration of the camp.